If Destroy All Monsters is one of the most renowned Godzilla films, All Monsters Attack (better known in the West as Godzilla’s Revenge) is assuredly among the least. A bizarre turn in the franchise produced on the cheap and self-consciously aimed at children, the film has long laid ignobly at the bottom of many a Godzilla fan’s rankings, serving the same role in many ways that The Final Frontier does for Star Trek or The Phantom Menace does for Star Wars. For many there is no worse kaiju film. In truth such declarations always embody more than a little hyperbole. Just as it’s a fruitless effort to try and define a single film as “the greatest” in a series, so is it just as pointless to define one as “the worst.” There will always be people who love and earnestly defend a widely derided film as well as those who can’t see what everyone loves about another. It’s probably accurate to say that most of us have experienced both sides of the coin and had our sanity questioned. But the truth is that no one agrees with everyone all of the time. All we can really do is assess the film on its own merits, try to acknowledge our own biases, and offer up what we think it does right... and wrong. I first saw All Monsters Attack many, many years ago when I was about ten. I was at the height of my Godzilla fandom then, going so far as to write and illustrate (poorly) my own fan comics alongside a bizarre crossover fic that pitted Godzilla against the Animorphs (apologies to those who did not grow up in the 1990s). In theory, All Monsters Attack, with its deliberate appeal to children and focus on a schoolchild (and earnest Godzilla fan) as its protagonists should have been right up my alley. It was not, however, and for all its attempts to elicit juvenile joy it felt flat with me, as it did with many. More than anything, I found it vaguely patronizing, as though it didn’t think I could handle a typical Godzilla film (the kind, after all, I’d been watching back to back for over a year at that point). That is not, however, to say that the film is without any merits. Indeed, as I’ve grown older I’ve found a greater appreciation for what the film was trying to do even if, in the end, I still stand by my initial assessment that it doesn’t really work as a whole, even if some of the individual parts do. Perhaps the oddest thing about All Monsters Attack is that the pieces which work best are those which aren’t even about Godzilla or other kaiju even though they too, honestly, could have used some refinement. Our story’s chief protagonist is Ichiro Miki, a young boy in elementary school who is obviously supposed to represent the typical Godzilla fan: young, imaginative, and deeply fascinated with the world of kaiju. In particular, Ichiro’s a big fan of Minilla, the “son of Godzilla” first seen in the eponymous film from 1967. This is pretty much the first time a child has ever been one of the lead protagonists for a Godzilla film (though it won’t be the last) and by itself marks a pretty major change in style. On a minor side note, it’s long been said that Ichiro was named as a tribute to director Ishiro Honda, who also helmed All Monsters Attack, though I don’t know if this has ever been confirmed. For much of my most recent viewing I referred to him as Hidechan, as a nod to director Hideaki Anno, who would be about the same age as Ichiro and was himself a huge fan of tokusatsu films and television shows like Godzilla and Ultraman growing up. Relatedly, Anno will himself be directing a Godzilla film next year. A single child to two working parents, Ichiro spends most of his evenings after school by himself, sometimes accompanied by the eccentric but affectionate toymaker Shinpei Inami, who acts a bit like a secondary father figure in Ichiro’s life. Among the other figures in Ichiro’s life are a gang of elementary school bullies, led by a boy name Gabara who torments Ichiro for his perceived cowardice. Between these two elements, Ichiro has a lot of incentive to daydream about escaping to his imagined paradise on Monster Island, where Minilla’s his best friend and he gets to spend all day watching kaiju battle it out. One of the more peculiar aspects of All Monsters Attack is that it’s never quite clear if Ichiro is a child from our world, who’s fantasizing about the fictional world of Toho’s tokusatsu films, or whether he actually lives in a world where Godzilla and Minilla exist and his fantasies are the equivalent of a celebrity crush. Either scenario works with the premise of the film and while I suspect Honda intended the former when directing, Toho’s largely treated the events of All Monsters Attack as canon in marketing. As it turns out, Ichiro’s fantasies aren’t entirely whimsical; Minilla has bullies too, principle among them being a giant ogre who’s name is... Gabara. 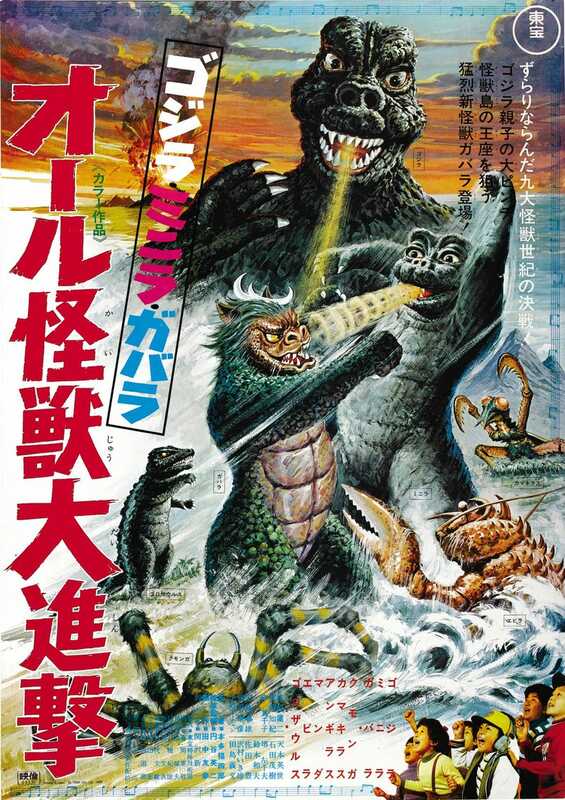 This is sort of what I meant by the film being a little patronizing; even as a kid it seemed pretty obvious the events on Monster Island were a heavy-handed metaphor for Ichiro’s domestic problems, complete with Godzilla being an inattentive father to mimic Ichiro’s own absent parents. In any case, Ichiro finds that in order to have fun with Minilla he’ll have to help the juvenile kaiju combat his own bully, leading to a little growing on Ichiro’s own. Meanwhile, in the “real world,” Ichiro accidentally attracts the attention of a group of bank robbers when, after exploring an abandoned factory, he pockets one of their driver’s licenses. Which they just happened to have left laying around, I guess? After learning of Ichiro’s absent-minded theft, the robbers set out to kidnap Ichiro (instead of just stealing back the license I guess), which puts Ichiro in real mortal danger even as Minilla’s situation in his fantasy grows more dire in parallel. Like I said, there are some things that work quite well about All Monsters Attack. It’s hard not to sympathize a little bit for Ichiro, alone and mostly friendless and with noting but his imagination (and a grown-up toymaker) to keep him company. I certainly could identify with his experience (even if my childhood was far less lonely and my parents far more attentive) and the film’s attempt to construct an imagined “young nerd/otaku” lifestyle isn’t actually all that far off. Plus, the bits with the robbers, while often goofy, works pretty decently as a proto-Home Alone set-up. I also appreciate the fact that director Ishiro Honda and writer Shinichi Sekizawa were trying to say something about life in Japan at the end of the 1960s, as the economic boom was really starting to take-off and life was changing massively for families across the country. Unfortunately, the whole thing doesn’t hold together and it’s easy to see why the film’s pretty widely disliked. First of all, there’s the aforementioned patronizing aspect to the film’s premise, which goes overboard in trying to make the film relatable and child-friendly. And really, I’m not sure any kid like Minilla as much as Ichiro apparently did (as reflected by the fact Toho basically abandoned the character after this film). Secondly, the kaiju scenes are, on the whole, irredeemably cheesy. Not only do they feature a lot of weird and off-putting scenes where Ichiro is conversing with a tiny (and very unconvincing) Minilla, but they are also made almost entirely out of stock footage from earlier Godzilla films, a mark of Toho’s decreasing budgets for its tokusatsu films. Seriously, aside from the scenes with Gabara or mini-Minilla they’re pretty much all recycled from Ebirah or Son of Godzilla. Even the “real-life” segments, which I thought worked the best, are kind of a mixed bag. The bank robbers, while kind of entertaining as stooges, aren’t exactly engaging villains and the ease with which Ichiro eventually escapes them is comical (which to be fair, was possibly the intention). Additionally, while I appreciate the fact that All Monsters Attack has aspirations to being more than just “another Godzilla film” the morals it actually imparts are kind of... well, sketchy. The solution to bullying? Apparently to either succumb to peer pressure or get even by socking them in the eye. And parents? You really should feel guilty for working to support your family. The film even seems to call out Ichiro’s mother in particular, as though it’s understandable (if unfortunate) that Ichiro’s father would be absent but her priorities are really screwed up. Still, All Monsters Attack does work on some levels. The music is surprisingly catchy (even if the children’s choir does get a bit obnoxious at times) and Gabara’s monster design is a decent take on the classical Japanese oni (for the brief moments in which he shows up). And like I said, it’s easy to sympathize with Ichiro in the film’s “slice of life” moments. But you do get the impression, especially considering Destroy All Monsters was meant to be Ishiro Honda’s last tokusatsu film, that it’s a movie no one really wanted to make in particular. Honda’s heart really isn’t in the kaiju portions but the movie doesn’t spend enough time in the real world scenes to build an actual story of significance out of them. And that leaves the film in kind of a weird place. Which is really a good way to describe All Monsters Attack. To quote Toho Kingdom’s Miles Imhoff, “[All Monsters Attack is]... weird. It’s a weird movie; it isn’t like your run-of-the-mill Godzilla flick. It has some interesting literary elements, perhaps a backwards moral that is admirable to some degree, and maybe uses just a tad bit too much stock footage. While it’s certainly not the best, it certainly isn’t the worst either.” It’s just weird. And maybe fun if you’re into that kind of thing. But don’t show it to your kids; they’ll probably hate it.